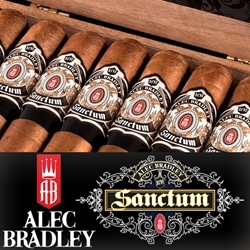 The Sanctum is another great addition to the Alec Bradley line of premium cigars. Handcrafted with a beautiful Honduran Corojo wrapper infused with binders from Costa Rica and filler tobaccos from Colombia, Nicaraguan, and Honduras. These complexed tobacco blends offer a creamy medium to full-bodied smoke delivering rich earthy flavors with an effortless draw and a seductive aroma. Alec Bradley Sanctum hand-rolled premium cigars are a top shelf brand and a masterful choice for every cigar connoisseur’s humidor. The Alec Bradley Sanctum is a premium line cigar offered at an everyday smoker's price, available to cigar lovers everywhere! Smokers Discounts believes you'll really enjoy these handmade cigars. We’ve made it easy and affordable to buy premium cigars online. A variety of sizes and flavors are listed below in our online cigar store. Each of these styles are in stock and available today for a low discount price. Call us for more details!